Hi everyone! It's an exciting day for me...it's my first post as an official member of the My Time Made Easy design team! And this new release is just amazing! The template (which is chock full of amazing accessories), the coordinating stamp sets and cut files, and the beautiful digital papers will allow you to create a plethora of different designs. You are only limited by your imagination! I created something for a design team friend who just had a baby. She's going to see this before I send it to her, but I'm not showing the contents (sorry Lisa)! She'll have to wait til it arrives at her house for that! As you can see, the envelope is open at the top and the card just slides inside. Too clever! 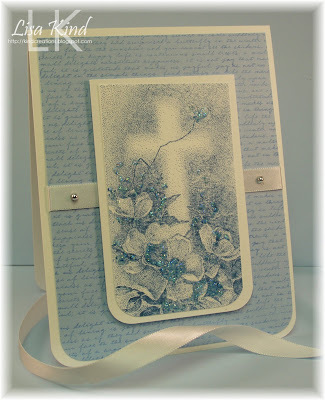 I used the previously released So Sentimental stamp set for the sentiments inside. 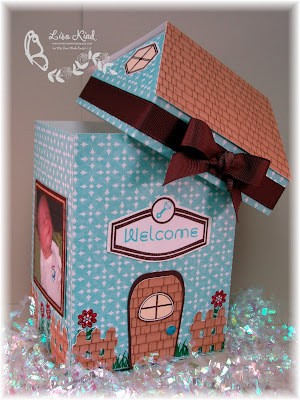 I started my project by printing this new Seawater digital paper for the base and the wood shingles design from the Construction Materials digital paper, which I used for the roof, door and fence. Before I put the base together, I stamped the grass (from the new Home Improvement stamp set) and flowers (from the previously released Sensational Stems stamp set). I used the Home Improvements Coordinating Cuts cut file for the fence and door. I added a metal dot to the door for a door knob. The sign, rattle, and sentiment are from the new Sign It stamp set. The Home Improvement stamp set also comes with a pretty big window. I stamped it on the Construction Materials paper, cut out the middle, and placed a photo of my friend's son in the window. (Isn't he adorable?) I added more fences, grass, and flowers. Now take a look at the picture on his onesie. You'll see where I got my inspiration for the other side of the house. Included in the On Display 1 stamp set is an aiplane in the clouds stamp. So I inked it up in the colors of the helicopter on the baby's onsie to look like it! So cute! Again, I added fences, grass, and flowers. I didn't want the back side to be boring, so I cut two windows from the Home Improvements Coordinating Cuts cut file and stamped it with the coordinating stamp from the Home Improvement stamp set. I also added the same windows to the "attic" part of the house. I colored them in with a copic marker. 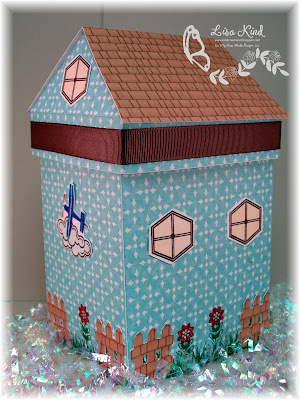 The roof panel is part of the template and was printed on the Construction Materials digital paper. The chocolate chip grosgrain ribbon and bow were added around the perimeter of the top part of the template to finish it off. Here is the box with the top off so you get an idea of how big it is. You can get a lot of stuff in there! One thing I finally figured out (after making many mistakes), is that if you are going to stamp on the box, do it BEFORE you put it together! Do some planning ahead. Here are some pics of what I did. Determine where the front and back of the box are going to be. This is an important first step. I then stamped the grass along the bottom of the box. I wanted the grass to show through the holes in the fences, so I stamped some a little higher where the fences will be. This is where I just placed the pieces down before adhering them. Lastly, I stamped the flowers at different heights. It was after all this was done that I added Scor-Tape and put the box together. I'm always so quick to put the box together before doing all these extra steps that I end up having to do it over! So I thought I'd leave you with some of my tips (if only to remind myself the next time I put one together)! Thanks for sticking with me through this long post! Stop my the MTME blog to see what Lauren has done. See you tomorrow for the MTME group post! There's going to be a lot to see, so make sure you stop by! 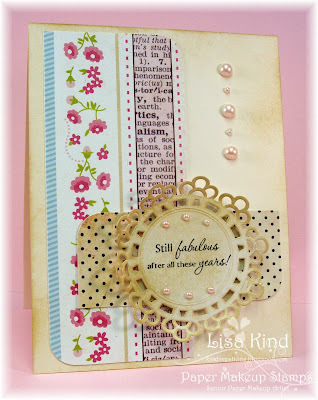 Just Us Girls Template Challenge and Fun News! Do you want the Just Us Girls challenge or the fun news first?.......Well I hate surprises, so I'll tell you my fun news first! 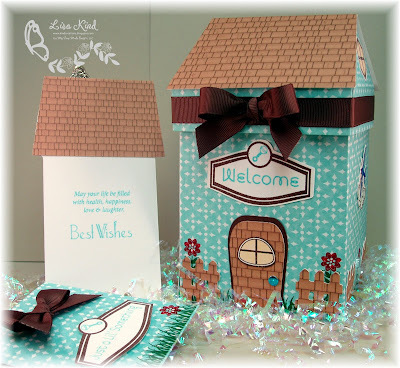 A while ago, Lauren Meader (My Time Made Easy) asked me to be a guest designer for her September release! I was so excited that she asked and of course accepted! Well, a couple of weeks ago, she asked me to be a PERMANENT member of her team! How exciting is that? Also new to the team is Tammy Hershberger! I'm so excited to be working with such a talented team! I'll be posting my sneak in a few days, so make sure you keep checking in! It's another great release! You can check out all the sneaks at the MTME blog. So now onto my JUGs post. 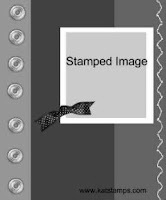 We are sponsored this week by Clear & Simple Stamps. 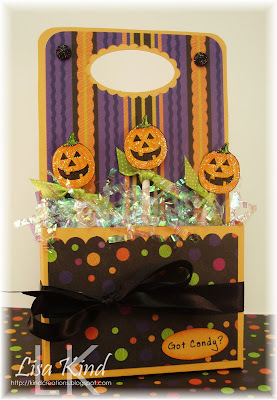 We are all using the set called Spooky Sweets and one of the Clear & Simple templates which you can find here. I used the treat pack template. I used Marigold Morning (remember that one?) as my base and a Halloween stack from K&Company. I punched an oval in the base and a scallop oval in the dp for the handle. Love the way that looks. I placed black glitter dots on either side of the opening. I didn't have any Halloween candy to put into the treat pack, so I made my own (sort of!). I stamped and colored three pumpkins and taped them to some popsicle sticks. There's a black satin bow that is tied around the treat bag that didn't come out very clear in the picture. Some filler in the bag and it was done! Now be sure to stop by the JUGs blog and check out the challenge. There is some blog candy to be won for this challenge! And the girls have more Spooky Sweet goodness to share with you! Thanks for stopping in today and enjoy your weekend! Meet Catie Cupcake! Isn't she cute? 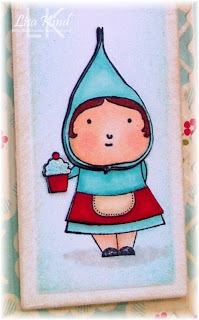 She's from Poppy Stamps and is a joy to color! Nice and quick! :-) I discovered her at our LSS, Buffalo Stamps & Stuff, and my friend Debbie has many of her colored up and displayed...I was hooked and bought a couple. I used the Thrift Shop dp collection from October Afternoon (I just love this line!) and kept the layout pretty simple. I pulled out a Martha Stewart large punch that I thought went well with the dp and punched the side. Then I just layered the other side of the dp using a scalloped long rectangle and then Catie. 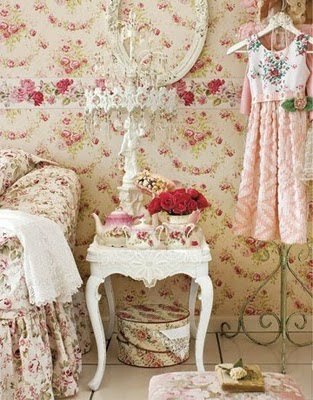 The sentiment is from PTI's Mixed Messages and the flower pearls are by Jenny Bowlin Studios. I had forgotten I had these until I reorganized my stuff! Our LSS had a garage sale on Sunday, and I scored the deal of the century! Someone was selling a Clip It Up (base and extension, extra clips, and little boxes) for.....$10.00! I thought she left off a zero! I was so excited and now most of my embellishments and stamps are proudly hanging, visible and within reach! Now I wonder if I can score another one because I still have more stuff to hang! LOL!! I stamped Catie twice and colored one entire image. Then on the second one, I just colored her head, the cupcake, and her apron. I cut them out and layered them on the first one with something new I also discovered at my LSS. It's called dimensional silicone by Decorator's Solutions. It allows you to mold the piece you are working with. Here's a closeup so you can see the dimension. Thanks for stopping by again! It's hump day and that much closer to the weekend! If you didn't see my post yesterday, I'm entered in a contest with some of my friends over at Paper Works Co. and need to drum up some votes. You can read about it in my post here. I'd love for you to vote (even if it isn't for us!). We are the Buffalo Stampers and can vote here. "Any one of us can be a rainbow in somebody else's clouds." Isn't that a great quote? It's a rubber stamp that's only available in a kit from Paper Makeup Stamps. We call them "makeup kits" at PMS! This one is called The Will to Day Dream. It's available at the PMS store here. Here's a picture of what's included in the kit (you should be able to click on it for a larger view). It's a great summer kit! Love the bright, fun colors! I used the Will fairy that's included in the kit on this card. I used just the wordart on this one. I just love this little card! I used two of the three ribbons in the kit. I ruffled the yellow one by placing a strip of Scor-tape on top of the brown ribbon and then made loops and tacked it down. I made the bow by just looping the ribbon four times and tying it with some floss, then I added the button. Easy peasy! 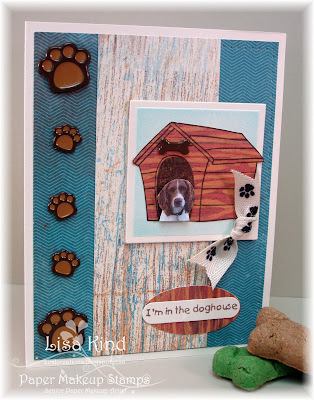 This card also qualifies for the current Makeup for the Weekend challenge at the PMS blog. Christi Snow challenged us to use four of any embellishment., but it has to be four of the same embellishment. So I used four of these sparkily buttons that are in the kit. Stop by the PMS blog and check out the challenge. Christi has a great sample for you! You don't have to use PMS images to play, but if you do you could win a PMS image! Hope to see you there! It also qualifies for the Simply Stamp #153 challenge - Pleated Ribbon. 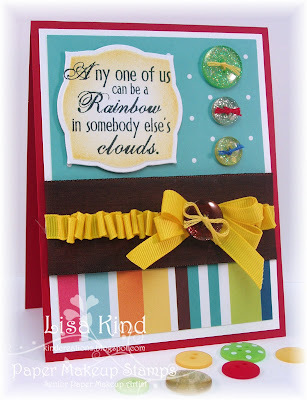 Sharon posted a link to a tutorial for a simple pleated ribbon that I used. I even sort of cased her layout for my design. This is my first entry in Sharon's challenges, although I've always followed and admired her work, so I'm happy about this challenge! On another note, I'm entered in the Ultimate Summer Challenge over at PaperWorks Co. with my friends Cheryl Rowley, Tracy Harp, and Debbie Morrissey. We each had to create a card in four different challenges. The voting began yesterday and runs through Saturday, August 28th. We'd love your vote! Stop by their voting page and cast your vote. We are called the Buffalo Stampers and you can vote for us in each category, if you are so inclined! If you want to vote for someone else, that's fine too! Thanks! Happy Saturday! It's time for a color challenge from Just Us Girls! I'm the hostess this week and I chose the happy colors! I wanted something that screamed summer, so I chose hot pink, teal, and lime green. I found these colors in the DeLovely paper pack from Cosmo Cricket. I just loved this image from The Greeting Farm (called Laundry) that I got at my LSS, Buffalo Stamps & Stuff, one day. I'm always doing laundry when I craft since my craft room and laundry room are in the basement. I don't mind doing the laundry, but I HATE folding it and putting it away! So this image really resonated with me! She's colored with copics and I added lots of Star Dust Stickles to the image. The felt flowers are from SU and are centered with a lime green glitter dot. The sentiment is from PTI's All Booked Up set. 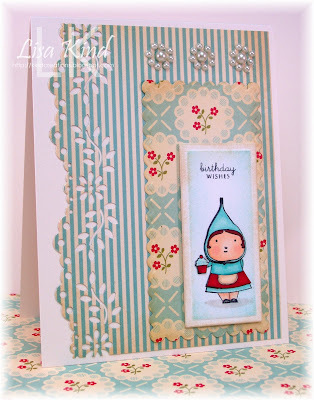 The layout is from Sweet Sunday Sketch Challenge. 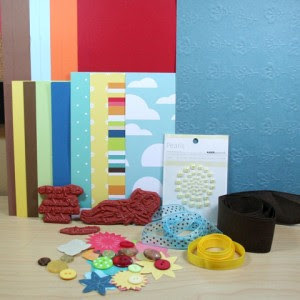 Stop by the JUGs blog and see what the girls have come up with using these colors! Some fab stuff there! Leave them some nice comments on their personal blogs too! Thanks so much for stopping by today! Enjoy your weekend! 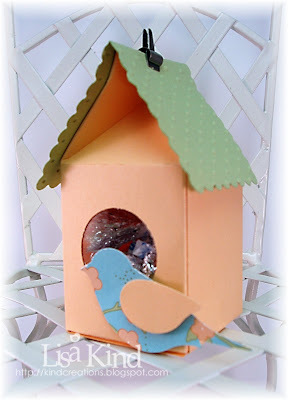 My friend, Tracy Harp, asked me to participate in a challenge sponsored by Paper Works Co. It's called the Ultimate Summer Challenge. I'm participating with Tracy, Cheryl Rowley, and our friend Debbie Morrissey (from Buffalo Stamps & Stuff). We are called the Buffalo Stampers. There were four challenges that each one of us had to choose...a sketch, color, inspiration, and technique. I chose the inspiration challenge. We were to be inspired by the image and the overall feel of the card. So the image I chose this image from Rachelle Anne Miller called Puddles of Fun. 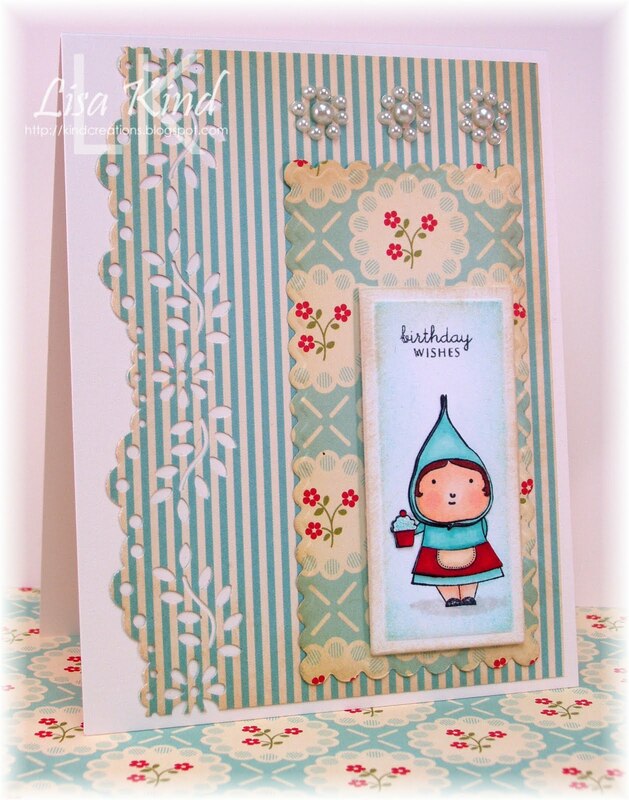 I was inspired by the umbrella and splashes of water for my card. I started with this dp from My Mind's Eye Quite Contrary line with umbrellas and used that as my color inspiration as well. The image is colored with copic markers and I placed star dust stickles on the puddle. The image had to be placed on an angle so you could still see the umbrellas on the dp! I used an EK Success punch on the bottom of the dp, then layered the backside (the yellow polka dots) underneath. I then put these blue and clear rain drops randomly on top of that. The bow is bermuda bay that I just looped around a couple of times to make the double bow, and placed a big yellow button in the middle. Our cards are on SCS for the judges to see. I would love for you to stop by and add some comments. You can find my card here and Cheryl's card here. Please stop by and leave us some love. Tracy has not uploaded her card and Debbie's card yet, but I'll link them when she does. Thanks so much and thanks for stopping in! I'm called upon often by my friends and family to make invitations for various events. My friend, Tracy, approached me to make communion invitations for her son in May. (I forgot to post this back then!) So this is what I came up with. I did these so long ago, so I'll try to remember what I used! 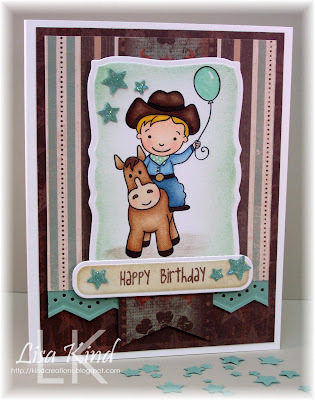 The image is from Paper Inspirations and I stamped it in Faded Jeans distress ink. I added star dust stickles for some sparkle. I needed to add something to fancy this up a bit more, but since it was for a boy I was a little restricted. So I went with the piece of white ribbon and added the silver pearls. I liked the look. I used a script stamp I had and stamped the blue background for more interest. I remember trying different Cuttlebug folders, but in the end this is what looked best. We had a christening to go to yesterday, and I made this card for that occasion as well. That's it for today! I think I'm all caught up on projects I haven't posted! I'll have more this week though! Enjoy your Monday! Happy Sunday everyone! I'm co-hosting a bridal shower for the fiancee of our good friends' son this afternoon. He is my hubby's godchild, so I wanted to do something special for them. Cindy is a lovely girl and I really like her. I offered to help her out with the wedding planning because her mom lives far away and everyone else was busy. I'm off in the summer, so I had tons of time! I even made their wedding invitations (which I'll share at a later date). The shower is a very small one, so I decided to make these shower favors. I cannot take credit for them. I received one at our Western New York Stamping Event in May, made by my friend Tracy Harp and her helpers. I saved it for just this sort of occasion. Here is a group post of the five different designs I made (I made 20 in total). Aren't they adorable? 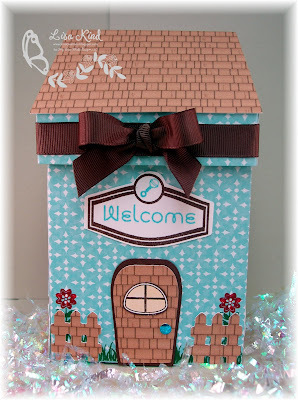 I used the Stampin' Up mini milk carton Sissix die and a 1" punch for the window. There is a piece of acetate blocking the opening. The roof is just a long rectangle nestie that was cut and then run through the swiss dots Cuttlebug folder. They were filled with Hershey Kisses (there are 9 of them in there) then held shut with a mini binder clip from SU. The bird is SU's punch (which I won at the Stamping Event...perfect!). I just used scrap dp for the body and scrap cardstock for the wings. Took a little time to make these, but they were super easy! Here's a closeup of one. 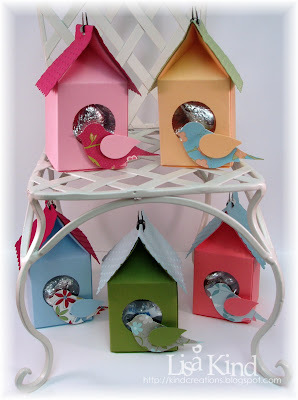 I also purchased three actual birdhouses from Pier 1 for prize giveaways at the shower. They will adorn the tables until they are given away. I love homemade gifts and favors like these! They really make a statement with non-crafters! Thanks for making a stop to my blog today! I love to hear your comments! They really make my day! Enjoy your day! 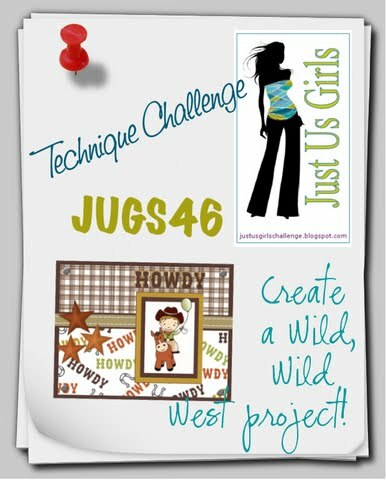 Just Us Girls #46 - Wild Wild West! 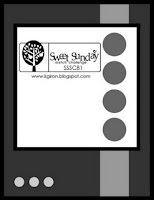 I used a digi image that was created as a charity stamp in Ethan's honor for my card. I just love this image, and I made it a birthday card for my nephew, also Ethan, who will be 6 years old this month. I used the SU western paper (retired and I don't remember the name right now) as my starting point along with the current Mojo Monday sketch. He's colored with the new technique I learned last week at a class at my LSS, Buffalo Stamps & Stuff. I colored him with copics, then went over it a bit with prisma pencils and gamasol. It adds a richness and smooths out the lines from the copics. (It works great on reds...I have such trouble blending the reds!) 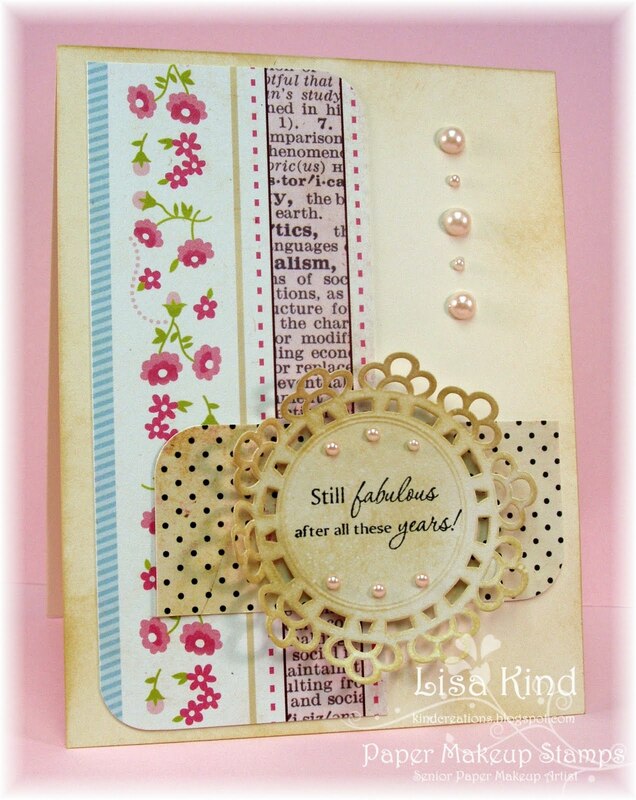 The sentiment is from Paper Makeup Stamps set called Birthday Cheer. Here is what the inside looks like. I think the sentiment is from Wordsworth. I've had it for years and it sort of fit with the theme. Here are links to the digi stamps that were created by Pink Cat Studios: Cowboy Billy, Cowboy Lilly, and Sweet Pea Cowpoke. JUGs is welcoming the fabulous Theresa Momber as a special guest designer this week. She has generously donated one of her sets from Gina K Designs called Out West to one lucky winner, too! Thanks Theresa! Also, I want to wish one of our fabulous DT coordinators, Pam Imholz, a very Happy Birthday on Monday! She does so much to make our challenges run smoothly and is a great person! So I made this card for last week's JUGs sketch challenge just for her (and kept it a secret, but forgot to send it...whoops! It'll be in the mail today!) Happy Birthday Pam! Enjoy your day! 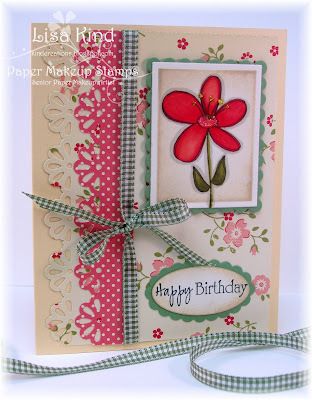 You can see the details of this Paper Makeup Stamps card here. Thanks for stopping by! Hi all! I totally forgot to post this little project I did last month for the birthday of my best friend, Maria. 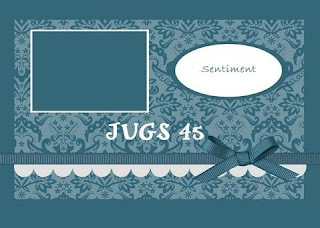 I had the card done a while ago for a JUGs challenge, so I decided to use a My Time Made Easy template to make a box for her gift to go along with the card. Here's the complete project. You can see the information about the card here (but I will say the sentiment is from Paper Makeup Stamps). The box is made from the template The Flapper from My Time Made Easy. (I'm always amazed at how big these boxes are when completed.) I used perfect plum cardstock for the base and barely banana for the flap. The dp is the same as the one on the card. I used the floral image from So Sentimental to decorate the front of the flap, and a pretty pink satin ribbon to tie it up. 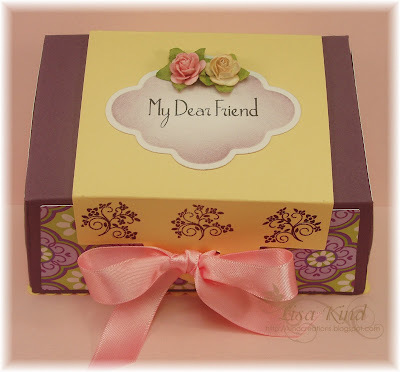 I used a nestie on the top of the box and a sentiment also from So Sentimental . 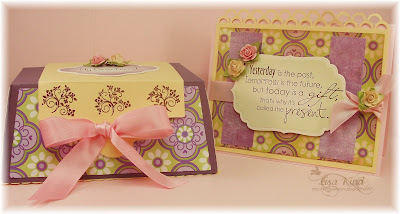 I swirled some perfect plum in on the inside of the shape and added some Prima roses that I also used on the card. I placed a Pandora charm inside the box. Such a pretty presentation and Maria loved it! 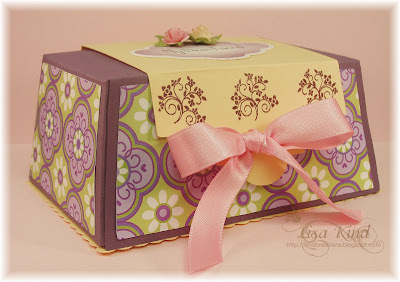 We had a good laugh, however, because I put the card and this pretty box in the most ugly gift bag I had on hand! She couldn't believe I did that! LOL!!! 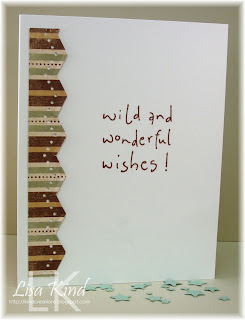 I have some other projects and cards that I had forgotten to post that you will see on my blog in the next few days. But tomorrow I have a special Just Us Girls post for our technique challenge. Please stop by then. I'll have some bridal shower favors to show you on Sunday that I made for a friend's shower. Too cute (but I stole the idea from another friend). I also made my friend's wedding invitations that really were beautiful, if I do say so myself! So make sure you stop by often! Have a great weekend! Hi all! Did you enjoy the Paper Makeup Stamps new release this month? It was a fabulous release once again! Today is the review day for the Home Matters set. This was previously a digi only set, but is now in rubber! Now if you know me, you know how much I love dogs, especially my own Lizzie! So I had to incorporate her into this card! She is always in her own doghouse...she just loves it, so I put her in this doghouse! I'm sure she's happy here as well! I took this picture of her with my iPhone and it is my wallpaper on my phone. She was staring at a ball I was holding while I took the picture! So I just reduced it to fit into the doghouse. 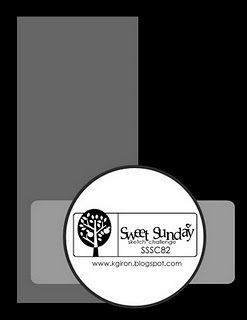 I stamped the image on this woodgrain dp from SU (Autumn something...can't remember the name). The paws and bone are brads and I snapped the prongs off of them and glued them down. The prongs tend to get too bulky. 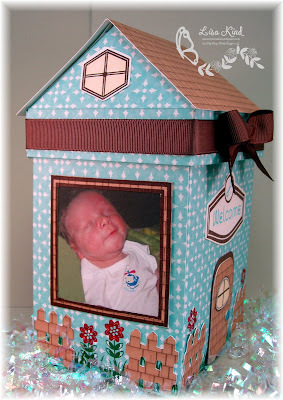 The sentiment is also from the Home Matters set. The sketch is from Queen Kat Designs. 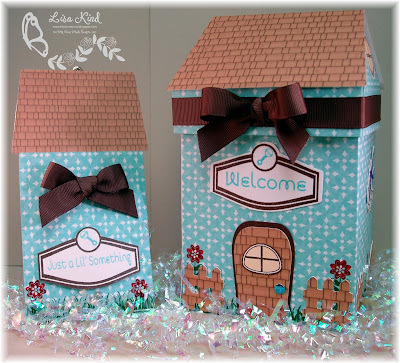 Stop by the PMS blog to see the rest of the reviews for this set that the DT created. Thanks for stopping in...have a great day! Hi everyone! You're getting a two-fer with this post! It is Release Day at Paper Makeup Stamps so the PMS DT are hopping the entire release today and we are partying later tonight in the PMS forum (more about that later). You should have arrived here from Dawn's blog. If not hop over to the PMS blog and get all the information there, then continue on the hop! You don't want to miss out on anything! But today is also the Just Us Girls challenge! Today Kathryn is the hostess and she provided this great sketch for us! So here is what I did with this sketch (which I flipped) and my NEW PMS image from the Color It Summer set. All the girls on the PMS DT have been lovin' this set...me included! The stem on this flower is much longer, but I just chopped it off with my nestie to fit the sketch! As usual, I started by choosing my dp. I just adore these October Afternoon patterned papers. 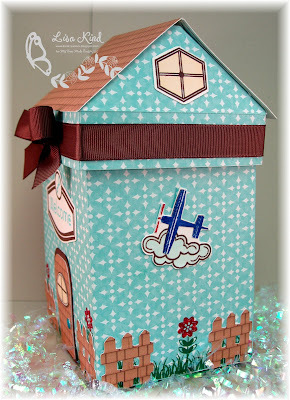 I used papers from The Thrift Shop and Fly a Kite collections. The flower is colored with copics AND prisma pencils. I just took a class at my LSS, Buffalo Stamps & Stuff, on Tuesday to learn this technique. Debbie (our instructor) uses this technique all the time and gets such a richness with both that you don't get with just copics. I used this technique on the card I did yesterday, and some commented on how rich the colors looked. Cool technique, but I still need to practice more. 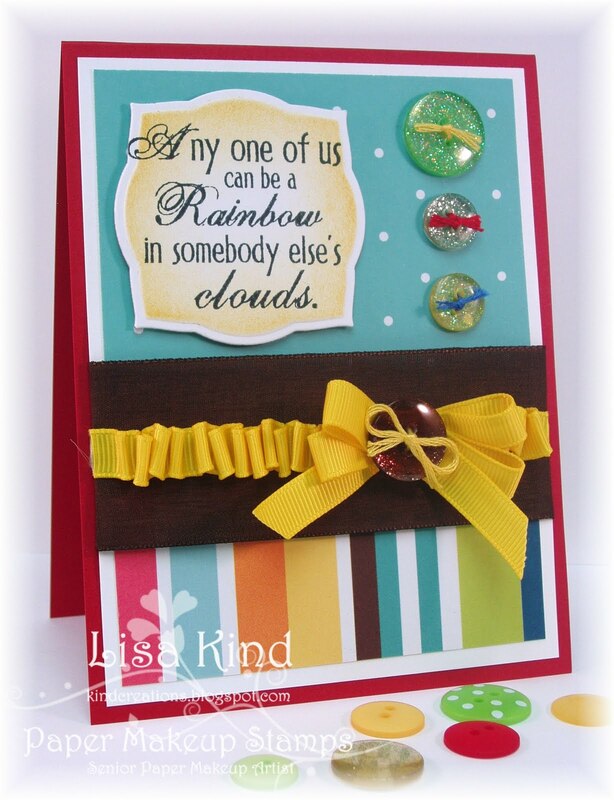 Anyway, I finished the card with a sentiment from PMS that was previously released called Birthday Cheer. Before you go, I want to invite you to the PMS Release Party tonight at 8:00 pm CST in the PMS forum. We'd love to see you there! Also, stop by the JUGs blog to see the fab cards the girls have done, and please stop by their personal blogs to leave some love! They'd love to hear from you! Now you need a letter from me. (Collect all the letters along the hop and it will spell out a code that will get you 15% off the new release!) I'll give you the letter "T" and send you on your way to Shaela. She'll no doubt have something great to share...she always does! Hope to see you tonight and enjoy the rest of your hop! A New Look and a Birthday Gift!